"Hi, I'm Richard Lai from Engadget. You guys probably hate us but..."
"No no, I don't hate you," Vertu's 52-year-old President and CEO interjected with a charming smile. He then laid a hand on my shoulder and explained our in-joke to the other chuckling diners, "These guys, they read the specs and they only judge by the specs." Of course, it was just a light-hearted banter the night before our interview, but having been with the luxury phone maker since June 2009 as President, Perry Oosting obviously knew of everyone's ongoing jokes about the rationale of his super expensive phones. Even before Vertu, the Dutchman would've faced a similar problem when he held senior positions at the likes of Bulgari, Prada, Gucci and Escada, except these brands have been around for a lot longer; and for us mere mortals, their existence is already widely accepted. Not so much for the luxury gadgets, though. "It is challenging in terms of the category," said Oosting, comparing his current job to his previous ones. "It is sometimes more challenging with the dynamism, because if you do luxury watches or jewelry, they don't really change that much." "We have total freedom in our choice after the sale to EQT." Indeed, the traditional fashion items are timeless if kept well and can be passed on from generation to generation, whereas a smartphone of any kind today can become "obsolete" in less than a year. In Vertu's case, its previous phones took a further blow as they were stuck with the aging Symbian, but that's no longer the case after EQT acquired the former Nokia subsidiary (Nokia still retains 10 percent minority shareholding). "We have total freedom in our choice after the sale to EQT, that's why we call it a new era for Vertu," said Oosting, while referring to his latest flagship, the Android-powered Ti. The CEO also credited the new board's mix of strong backgrounds for his company's newfound support, especially with former Nokia Executive Vice President Anssi Vanjoki as the chairman, as well as former Nokia SVP Sourcing and Procurement Jean-François Baril and ex-CEO of Gucci Group Robert Polet as board members. Of course, it's slightly ironic that two-and-a-half years ago Vanjoki likened the industry's adoption of Android to Finnish boys peeing in their pants for warmth in the winter, but in his defense, Google's mobile platform has changed a lot since then. 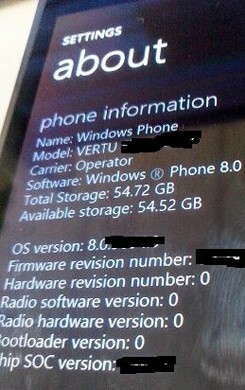 Oosting acknowledged that at one point his team had considered embracing Windows Phone, but eventually they determined that its UI doesn't give a true luxury experience, and the nature of Microsoft's semi-open platform would've made it difficult to implement Vertu's customization. The exec also said he's keeping an eye on the HTML5 platform, and in an ideal world, he would like to just offer a phone that lets you pick whichever OS you desire, "because an operating platform is just an enabler." In the words of Oosting, specs are an element of an experience, but not a driver of the experience. He sees Vertu's products being more about the sensory experience -- hence the Bang & Olufsen stereo speakers, the sapphire screen and the Grade 5 titanium on the Ti -- and less about fighting the spec war. At a time when 5-inch 1080p screens and quad-core chips are the norm for flagship smartphones, Oosting said his team deliberately chose a smaller 3.7-inch 800 x 480 display for the sake of ergonomics, and they picked the dual-core Snapdragon S4 MSM8260A from Qualcomm simply because from an end-user's point of view, quad core makes little difference. And no, there's no LTE here. The CEO lamented its effect on the battery life, and judging by the lack of LTE coverage in Vertu's core markets (such as Greater China and the Middle East), there's simply no immediate need for it on the phone. 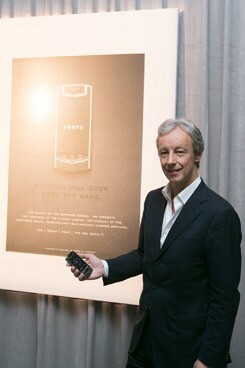 Even the US, where 4G is widely available, is a relatively small market for Vertu. "It wasn't a choice of 'We need 4G because for the sake of 4G.' It doesn't mean we're denying that but it's more about if the timing is right." That said, the Ti does support DC-HSPA+, so its downlink can already go up to a speedy 42Mbps. "Apple doesn't talk about specs because it's a total brand experience, and that's in a way very similar to us." Throughout our conversation, Oosting often brought up the iPhone 5 as the odd one out in the spec war, and he has a point: it only has a 1.3GHz dual-core chip and a 4-inch display, yet it still gets good reviews. "Apple doesn't talk about specs because it's a total brand experience, and that's in a way very similar to us, much more targeted to a certain consumer," said the exec. Perhaps with slight irony, he proudly added that the Ti packs more oomph than Apple's latest mobile phone. "The iPhone 5 has a processor of 1.3GHz dual-core, and we have 1.7GHz dual-core. You know the iPhone 5 doesn't have NFC? This one has NFC." One analogy Oosting used on the topic of specs was the horsepower on different luxury cars: he doesn't think people would choose one over another purely because the former has, say, 5 extra units of horsepower. Instead, it should be about the total experience, including the design, touch and feel, uniqueness and exclusivity. Oosting also added there's the question of whether you can identify yourself with the values and authenticity of the brand. "Because, I mean, you could take a luxury car and there's a Ford engine in there, and you say it's luxury but, you know, is that the value you're going to go for?" Leaving the technical specs aside, a comparatively more positive differentiator for the Vertu Ti is its total-service proposition. On top of the curated articles and privileges based on the user's passion points, the phone also comes with one year's worth of Vertu's famed 24/7 concierge service (renewal starts from £1,850 or about $2,800 per year afterwards), which can handle pretty much anything as long as it's legal: travel arrangement, business research, preparation for buying a house or event planning (like having a plane write a message in the sky on Valentine's Day, or bringing elephants to a wedding in the UK). But there's a bit more to that. "The real difference of our concierge service compared to others: we are 100 percent independent, meaning we don't take any penny from anybody to do certain things," Oosting said. "We make money selling devices, we will not jeopardize our independence." The exec continued by pointing out that there are credit card institutions whose concierge service will not arrange hotels or restaurants where their cards are not accepted. Likewise, some concierge services may have a bias towards hotels with better kickbacks, while their customers risk missing out on other hotels with better facilities. Even though Vertu positions itself in a category where the majority of us can't access, Oosting is still in touch with the more common mobile brands like ZTE, Huawei, LG, Sony and HTC. Again, here the CEO discusses the balance between specs and experience. "Let's say ZTE has the highest specs than all of the other brands together, would they sell more and would they be more successful? I don't think so, because it's an element of the brand, it's an element of the execution, it's an element of the implementation, it's an element of the marketing. And those are all the aspects of building a business and building a brand. "I was in Barcelona [for MWC]. The LG Optimus G Pro was one of the higher-spec phones. Did I like the device? No. I liked the HTC and the Sony better from a design point of view, from a feeling point of view. So is it the specs? Is it only that race? Is that really all the consumer's noticing?" At this point, Oosting dropped us a bombshell. "There are companies with higher specs that are losing money. Which companies are actually making money? 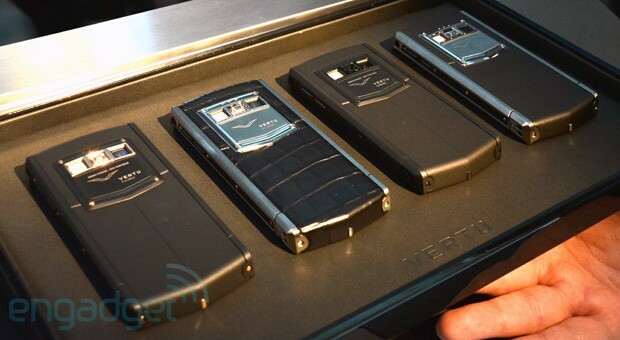 Apple, Samsung, and there's one more: Vertu." 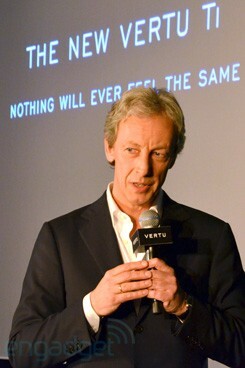 In fact, Vertu announced that 2012 saw the company's third consecutive annual rise in sales turnover, even though it had no major product launches that year apart from the Constellation Smile -- a variant of the Constellation -- launched in June to support a charity called Smile Train, who provides corrective cleft lip and palate surgeries for poor children. "Look, don't get me wrong," Oosting continued. "I'm not here to say the others are bad. I'm just saying the volatility of that run of that mass market business is a challenge." The exec then went on to reiterate that his comparisons were purely out of passion instead of smugness. "We need to be very modest and humble." All that talk about luxury items left us with the question on affordability: how rich do you need to be to own a Vertu device? "Rich enough to pay the price. We don't discount our products, you need to go for the full price," said Oosting, who then fired the same question back about other luxury items and their much more affordable counterparts: a Mont Blanc pen versus a normal pen, a DuPont lighter versus matches, or a Patek Philippe watch versus a Swatch watch (the latter of which, as pointed out by Oosting, is more accurate with its quartz movement). "So again, the rational element. That I think most people are still struggling with because the category is still so new, the category is still evolving, but there's nothing different compared to any other category," said Oosting. "If you only buy things to cover yourself up to keep warm then that's not the driver. You buy them because you think it's you, because you want to express your personality. So it's an expression and it isn't how rich you need to be. "It's not a rational element. If it's only rational then it will be a damn boring life." "How rich do you need to be to buy a B&O TV when you can buy another TV? You know, I have myself a B&O TV and stereo, and you know why I did that? Because I like it, and I think it looks great. And it's not the bragging element. It's an element of how I think it really would look great in my living room. I got these pencil speakers and I love the design of them, I just love the look of them. I could buy the latest Samsung SIM card camera (the Galaxy Camera), but do I need it? No, absolutely not. Do I need a mobile device from Vertu? No, nobody needs it. It's not a rational element. If it's only rational then it will be a damn boring life." According to Oosting, the current Vertu customer base consists of mainly 30 to 50-year-olds, and male users take up 75 percent of the entire group. Many of these are apparently successful entrepreneurs who "aren't afraid to be different" and "have a high appreciation for beautiful engineering, element of craftsmanship and uniqueness." Oosting also acknowledged the increasing acceptance of the death of physical keyboards on phones, and while he used to be a key person himself, he can now easily use the TouchPal Android keyboard he installed to match someone else's typing speed on an old-school BlackBerry. "You cannot go against the trend because in the end, all the technology and innovation and quality go into touch," Oosting added. Even though we didn't dig into the Chinese market deeper in our conversation, I brought up the issue on fake Vertu phones being made and sold in China. In fact, I even handed Oosting a fake Ascent I found in Beijing, at which point he started gracefully examining it with his glasses on. "We are doing something about it, we have a legal team who work with the legal authorities in those countries where it's manufactured, which is unfortunately mainly in mainland China," said the amused exec. "But it's also distributed in Russia, the Middle East and Europe. The thing is that it's very hard to stop that sometimes, because once you close a factory, the other one's already opening." Pretty sure the other consumer electronics giants -- like Sennheiser, for instance -- would agree as well. As to where Vertu will go from here, it sounds like it'll be sticking with Qualcomm and Google for a while: Oosting appreciates how close his company works with them in both London and California, and apparently Andy Rubin, Google's SVP of Mobile and also the father of Android, is a fan of Vertu as well. "So we feel good for the future," said a delightful Oosting. "Of course, who needs €7,900 for a phone? Again, nobody, the answer is nobody needs one; but nobody needs an expensive watch, nobody needs an expensive car, nobody needs a suite in a hotel.